CPM (Critical Path Method) is a mathematical algorithm that helps you analyze, plan, and schedule complex projects. Each project consists of a number of tasks and activities that are interconnected and essential for project’s success. The more complex the project gets, the more demanding the project management is. That's where CPM comes in hand. At its core, CPM is a powerful tool that allows you to identify the longest path of planned tasks necessary to meet the deadlines and identify the early start and finish dates. By determining the critical path, you will know which activities are critical in completing the project, and which ones won’t have any serious impact on the project development and can be delayed. In the late 50’s, EI DuPont de Nemours Company, an American chemical company, was seriously falling behind its schedule, and they needed something that would get them back on track. They came up with a solution to divide their project into thousands of tasks, measure the time each task will take, and how asses critical they are to the entire process. They called this technique Critical Path Method or CPM. CPM was first tested in 1958 in a project to construct a new chemical plant, and has ever since, been one of the most frequently used techniques of project management. By using the project scope, you can break the work structure into a list of activities and identify them by name and coding; all activities must have duration and target date. This is the most important step as it gives a clear view of the connection between the activities and helps you establish dependencies as some activities will depend on the completion of others. Early Start ES - earliest time to start a certain activity providing that the preceding one is completed. If there is a delay in any task on the critical path, the whole project will have to be delayed. The critical path is the path where there can be no delays. Naturally, not all the project activities are equally important. While some have a huge impact on the critical path and are therefore critical, others don’t make much difference to the project if they are delayed. The critical path method helps us determine which activities are “critical and which have “total float”. However, if any of the floating activities get seriously delayed, they can become critical and delay the entire project. Take home building project for example. In order to build a house, you need build the foundation first. Construction is a sequential process where all the activities from clearing the lot to building the roof follow one another and are dependent on each other. If you don’t frame the house, you cannot insulate; if you don’t do drywall, you cannot paint. 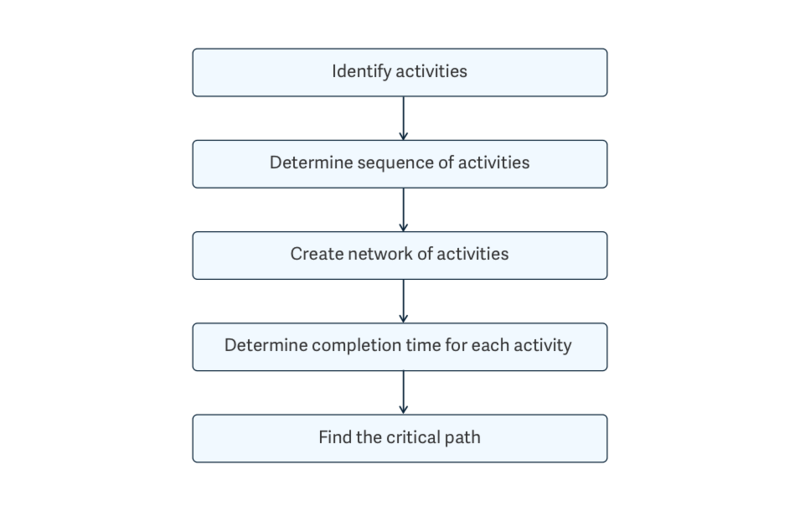 Critical path method allows you to first identify all the activities, then figure out how long each will take, and finally determine the longest path, also known as the critical path. Once you determined the activities of building a house (clear lot, poor footings, frame house, insulate, drywall, paint, and roofing), you need to establish their dependencies. For instance, while you cannot frame the house until you have poured the footing, exterior siding and roofing can take place at the same time. Although some activities can happen at the same time, all activities must finish at the designated time identified by the critical path. The next step is to identify the time necessary to complete each activity. While painting may take 7 days roofing will take only 3 days. The fact that floating time is not on the critical path makes all other activities critical. That is, if one activity on your critical path is 5 days late, it means that the entire project will be 5 days longer than expected. 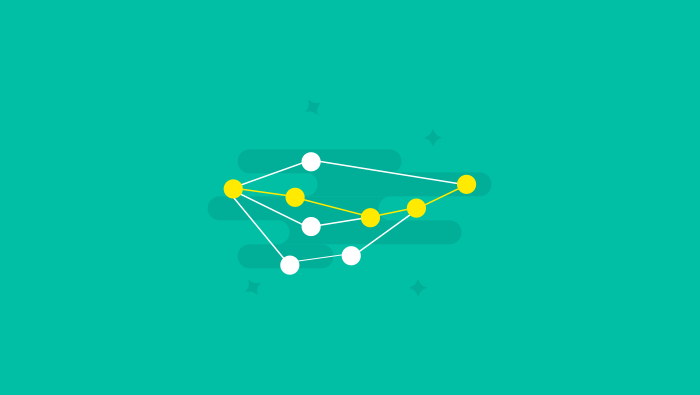 As much as we would like to take the best out of the critical path method and make our projects run smoothly, there are still certain limitations that affect our projects and create new dependencies. For example, if the number of team members suddenly drops from 10 to 7, you face resource limitations (ie. resource constraint). In such scenario, the critical path changes into “resource critical path” where resources related to each activity become an integral part of the process. This means that some of the tasks will have to be performed in a different order which may cause delays, and, consequently, make the project longer than expected. The critical path method lets you stay focused on the big picture by giving you a clear view of all project activities and its potential outcome. The best thing about CPM is that you can reschedule less important tasks and focus your efforts on optimizing your work so your team can avoid delays.